The curse of a drag queen who Remington mocked when he was child has started to turn this ladies-man gay overnight. If he can't convince a straight guy to switch orientations with him before the bell tolls, he will be gay forever. This wouldn't be such a terrible thing but there's an anti-gay serial killer on the loose and drag-queen zombies invading from all corners. Remington and his rag tag group of friends will only be able to survive the night if they can learn to be true to themselves. When Remington was a child, the townspeople mocked him because he was gay. Now, after having been cursed by a mean drag queen, he has become fabulous. The curse says that he must find a straight guy who will switch sexual orientations with him or else Remington will remain gay forever and he only has a limited amount of time to do so. Now Remington has another problem---he is torn between the list he feels for Jiggs, his best friend and the love he feels for his girlfriend, Hannah. On one hand he thinks he would not being gay but there is a serial killer on the loose and he is going after gay men while at the same time drag queen zombies are invading the area. The only way that Remington and his friends will be able to survive is by staying true to themselves. We might expect this to be just another gay schlock film made up of all those themes we have seen over and over again but this time the film is filled with so many different elements of horror, comedy, romance, and queer genres but there is more than the usual slapstick and zombies. This film is subversive, delivering a message that sadly and unfairly may not be universally accepted. It is set in a small provincial town in the Philippines and follows the story of Remington (Manuel Escudero), a stereotypical macho Filipino who works hard at manual labor during the day and drinks hard at night. When he was a little boy, he was cursed to become gay by an older gay male (Roderick Paulate) whom he angered because he teased him all the time. 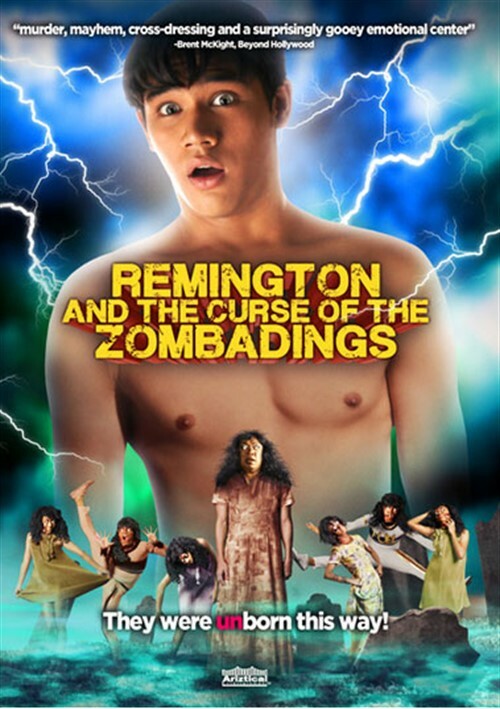 Remington begins to feel the curse as he slowly turns gay-first he gets the stereotypical gestures, then the language, then he finds that this new sexual orientation puts him in the middle of a three way along with his best friend (Kerbie Zamora) and his own girlfriend (Lauren Young). As he transforms, his mother, a police officer (Janice De Belen) is involved with investigating a serial killer who is murdering gay men. All of this sounds crazy and it is. There are "rollerblading widows, vengeful drag queens, homophobic serial killers, gay zombies" but they all come together is a very intelligent film that is carefully produced and directed by Jade Castro as if he is conducting a major symphony orchestra. The film is a lot of fun if we just sit and watch it without thinking but it is more than that. We can see it as an epistle to empowerment, the right to choose and a slap against intolerance. We see that we cannot take either freedom or excess too seriously and there still exist negative feelings against LGBT people in more places than we should care to count. There are several hilarious scenes in the film yet there is the expectations that society places on gay people, one of which is to show that a heterosexual life is preferable. The film has been gathering a cult following akin to "Rocky Horror" and while it is not a perfect film, it is a lot of fun as it treads the line between offensive and subversive and the realistic and the caricature while never losing it humor. Christians should have a field day attacking the film but that is good publicity. You do not want to miss it. Finally we have a film in which the gay characters are tragic or martyrs---they just ARE.